Welcome. Please take a look around. Find out Why a Ban is Necessary .Sign our Petition. Sign up for our E-Newsletter. Follow us on Facebook,Twitter, YouTube, and Flickr. Read our Articles. Buy our Merchandise and support us by sending a Donation. Click on Carriage Horse Issues and learn about existing laws, proposed legislation, letters to the editor, media coverage, the Comptroller's audit. Tourists, please click on the Tourists button. horse-drawn carriage trade in NYC. WHERE HAVE ALL THE HORSES GONE! 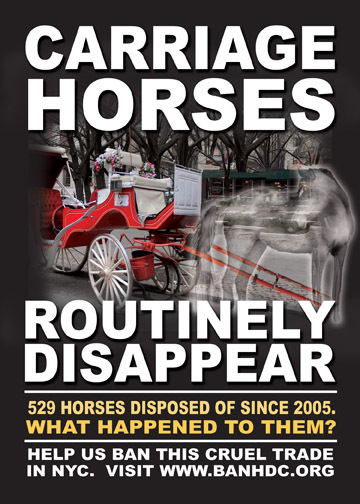 7 1/2 year study reveals a very high turnover of NYC carriage horses averaging 71 per year. 529 have turned over since the end of2005. WHAT YOU CAN DO -The most important thing you can do as an individual concerned with carriage horses in NYC is to contact your elected officials and get them to support the Avella/Rosenthal bill - S667/A997 in the state legislature, which would prohibit the operation of horse-drawncarriages in NYC. This is not an iconic business- it is thecarriage drivers and the media that promote that. This is abusiness that exploits horses and that continues to break the law, enabled by the City agencies in charge and by the ASPCA. It is a business that has held NYC hostage for years. On any given day, you will find carriage horses being left unattended and untethered at the hack line while their drivers socialize with other drivers and fail to pay attention; making dangerous u-turns in heavy traffic around the Central Park Area. You will see carriages being over loaded because no one in authority is monitoring the situation. And this does not even begin to touch on their living conditions, which include no turnout to pasture; "legally"working 9 hours a day, 7 days a week; stalls,which are legal,but less than half the size of what experts recommend. See The Top 15 Reasons why NYC Should Ban Horse-Drawn Carriages. Politicians- do not be left behind. Please open your minds and your hearts. 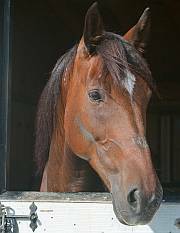 If you do not care about horse welfare - then you need to consider people and the human safety issue - flimsy open carriages; most importantly, the nature of a 1,500-2,000 pound animal whose first instinct is to flee the scene when frightened becoming an unwitting weapon. 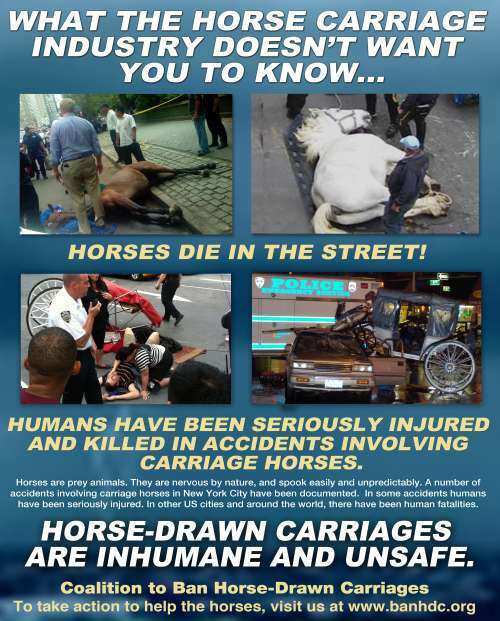 Around the world people have been killed because of out-of-control carriage horses spooking -- both passersby and those in carriages. A five-year old girl; an elderly woman, a young boy. It is only a matter of time before it happens in NYC because the conditions are ripe. Please help to bring NYC into the 21st century and help relegate this dangerous business to the coal bins of history. 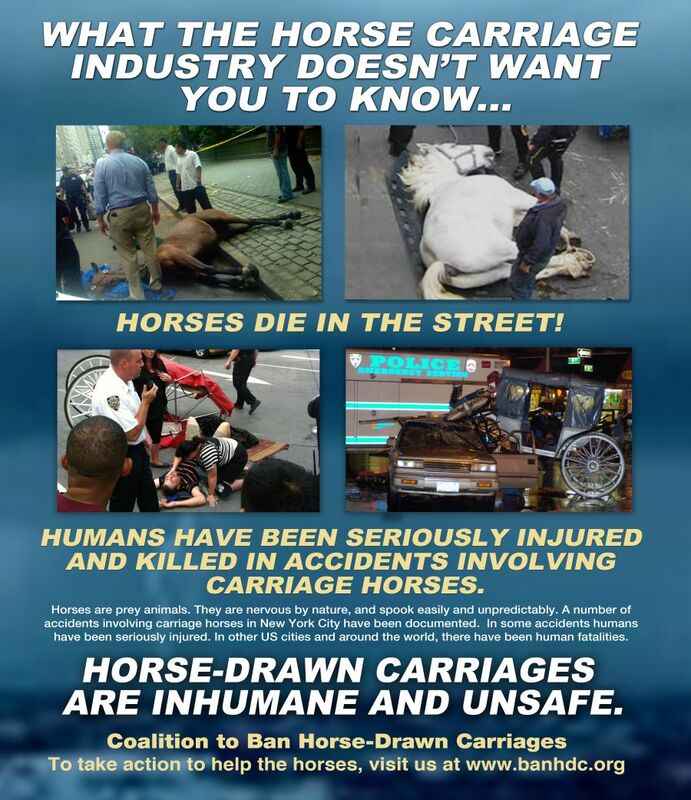 If you witness any sort of abuse concerning carriage horses -- whether direct or a carriage working where it shouldn't, please let us know at coalition@banhdc.org.I may suggest you contact the ASPCA, but it is crucial that you let us know so we can track the complaints. Fair Use Notice: This website may contain copyrighted material whose use has not been specifically authorized by the copyright owners. We believe that this not-for-profit, educational use on the Web constitutes a fair use of the copyrighted material (as provided for in section 107 of the US Copyright Law). If you wish to use this copyrighted material for purposes of your own that go beyond fair use, you must obtain permission from the copyright owner.